Yes, the wait is finally over! We have the two winning photographs for our #DekhoMagarPyarSe contest! #DekhoMagarPyarSe, as many of you would know, was an Instagram contest conducted from 21st February to 10th March. 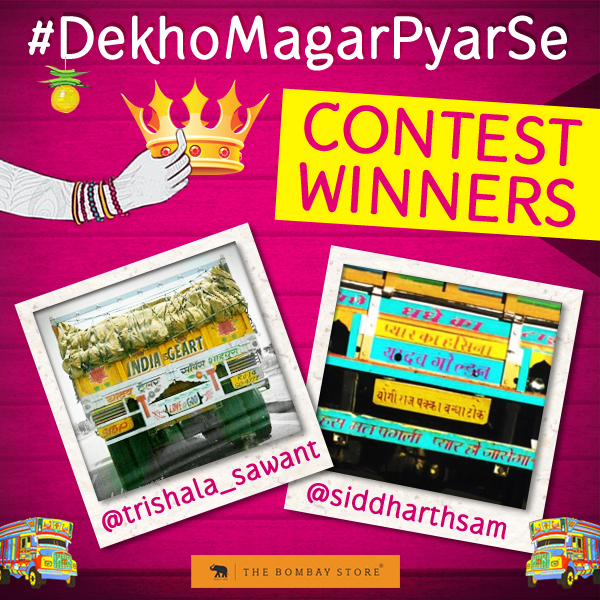 Under this contest, users were supposed to Follow and Tag @thebombaystore and share images of any interesting graffiti/message on a road transport vehicle like a truck/autorickshaw/tempo that they come across with #DekhoMagarPyarSe. A celebration of the ‘Truck Art’ in India, we were overwhelmed with the tremendous response received for this contest. In over a weeks time, we have more than 550 users following us on Instagram and more than 200+ entries for the contest. Our Instagram account is filled with interesting images from all around India. It is a very happy feeling to be a part of your daily lives. Below are the winning photographs and names. Congratulations to the winners on winning exciting goodies from our new collections! If you wish to grab some exciting merchandise from our latest collections, stay updated about our contests by following us on Facebook, Twitter, Google+ and Instagram.